We all have something to share! It has been fascinating to hear Stephanie S's, Kathy's, Mary's, Marcia's, Patsy's, KAT's, Lisa's, Stephanie C's, Kristin V's, Sigga's, Kat's, Elisa's and Jenny's stories and to learn more about each Featured Artist. 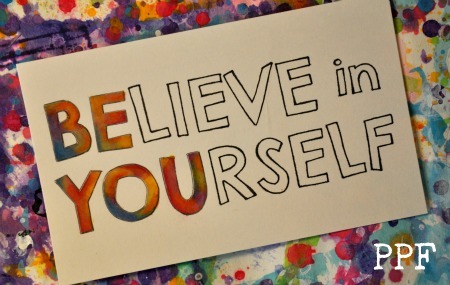 Such inspiration! Similarities, differences, uniqueness and wonderful paintings. Thank each of you so much. Now that we have that bit of business out of the way, let's get this party started! Have a great creative week! Lots of parties going on this week... Happy Canada Day and Happy Independence Day to all of those celebrating. Hope you see magnificent fireworks! 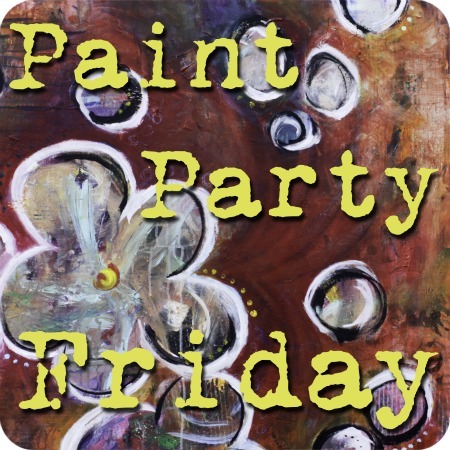 Welcome to Week 14 of Paint Party Friday (Year 2) and to the next edition of our Featured Artist Series! (Would you like to be a PPF Featured Artist? Please click here for details!) This week we are thrilled to feature an inspiring artist all the way from the Phillipines. Please welcome Elisa Choi from Harmony Thoughts! 2. What are your favorite techniques, media, and tools to use in creating your paintings? I use watercolor in all of my paintings. I love it! I have acrylics and oil paints but haven't tried using them but I will! Also I use oil pastels, watercolor pencils, prints from used materials for textures, gesso, color pens and magazine for collage. For digital painting I use PhotoShop. 3. What is your favorite thing to paint? Why? I love to paint trees and nature scenes (nature lover! ), abstract-like painting which are a result from my intuitive painting (it's liberating!) and painting my on-location sketches (I enjoy sketching on-location). 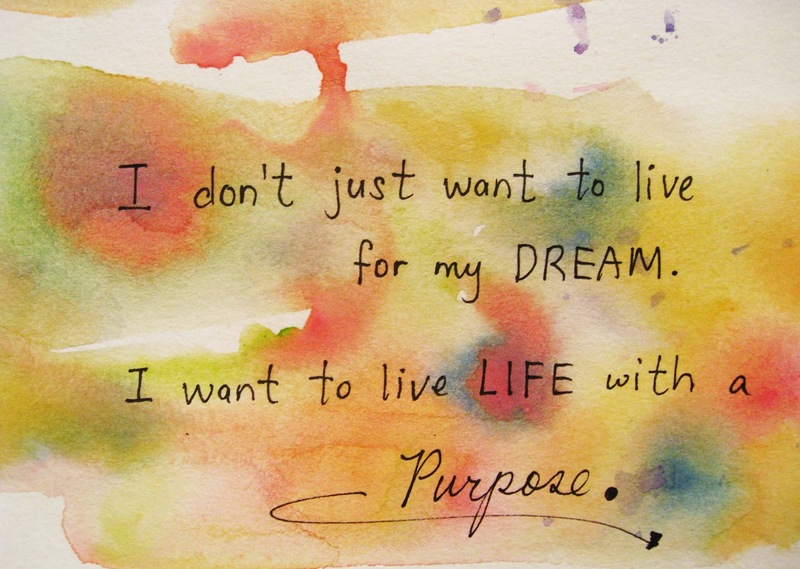 I usually incorporate inspirational wisdom (encouraging words about life and God) on my paintings. Another Fun and visually stunning party last week with so many wonderful paintings! Have a fun, painting-filled weekend! 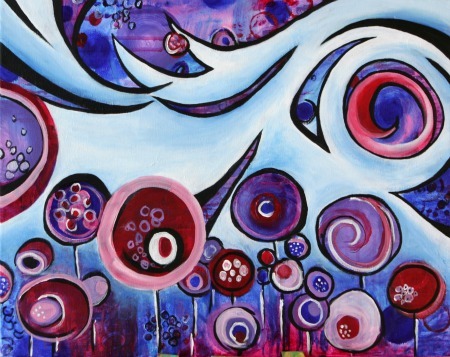 Welcome to Week 13 of Paint Party Friday (Year 2) and to the next edition of our Featured Artist Series! (Would you like to be a PPF Featured Artist? Please click here for details!) 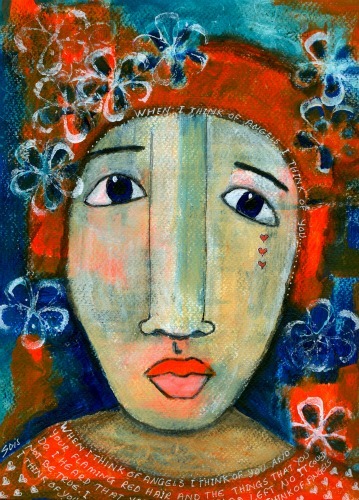 This week we are thrilled to feature a talented artist who inspired many of us to "liberate our art"** last year. Please welcome Kat Sloma of The Kat Eye Studio! 1. Please tell us a bit about your personal history with painting. (When did you start painting? How has your painting evolved since you first started?) Up until high school, I always took art classes. Watercolor painting was my love at the time. Sadly, as I neared the end of high school, all of the college prep classes filled my schedule and slowly art was dropped. It wasn’t until a couple of years ago, more than 20 years after high school, when I moved to Italy for a temporary work assignment that I felt called to paint again. But this time, I wanted bright vivid colors, something I had never learned to do in watercolors. I decided to go with acrylics and just started playing. My first few paintings were from photographs, but this quickly lost its appeal for me. Since photography is my primary art, I felt like I could already create imagery that represented real life. I discovered I was craving to paint colorful, abstract art. I wanted to paint color and emotion, rather than represent reality, but I didn’t know how to get there. I was lucky enough to take Flora Bowley’s Bloom True course at the Do What You Love Retreat in England last year. That course helped me push through my preconceived approaches to painting toward abstraction. I’m still figuring out how to paint what I feel. 2. What are your favorite techniques, media and tools to use in creating your paintings? Right now, my favorite tools are my hands and fingers! I love the feel of paint on my fingers, smearing it around the canvas. I also use my spray bottle a lot. I love what water does to the paint – blending and dripping. It’s so unpredictable! I also like working with layers, building up multiple layers and seeing what emerges. 3. What is your favorite thing to paint? Why? My favorite thing to paint is really color. Bright, bold color! Where else can I choose a color and create based on my mood? I love color in my photography, but I am limited to what is already there. With painting I can pick colors that appeal to me. It’s interesting to see how I’m drawn to some colors over and over again. 4. What is your proudest painting moment and/or greatest painting achievement so far? My proudest painting moment was last summer, when I finished my first abstract painting completely on my own. Instead of following a photograph or an instructor, I felt my own way through the process. I started by choosing my colors and letting the painting evolve as I built up the layers. I could never have predicted how it turned out. I was pleased to see that I could paint this way and end up with a finished piece of art! Painting is so different from photography, where I compose an image from what is already there. 5. What’s next in your painting future? Hopefully, painting regularly again is in my future! After last summer’s success I haven’t been back to painting in a long time. My creative inspiration ebbs and flows in many directions… painting, photography, writing and music. The pull to paint is coming back, though. There is something about painting… I just know it’s not done with me yet! I always have my easel set up and paints available for when inspiration strikes. I have this feeling that someday my painting and my photography will come together into one art form somehow. I’m going to continue to let things evolve and see what happens! Thank you, Kat! 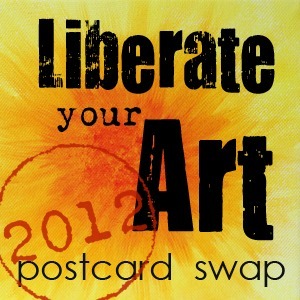 One final question... Last year many of our PPFers participated in your Liberate Your Art Postcard Swap. We are very excited to see that it is back for a second year, would you mind telling us a little bit more about the motivation behind it and how we can sign up? Yay! I'm so excited to tell you about the swap. The idea formed when I was living in Italy, from so many influences... I truly treasured each piece of mail I received while I lived in Italy, each one was a physical connection to people far away. I also started to print my images on postcards, and send those to my friends with a little note. The postcards were inexpensive to send and my friends always loved to get these little surprises in the mail. It's amazing how excited people would get to receive a simple picture with a note on the back! Knowing it was my artwork made it even more special to them. I made many new connections during my time in Italy too, with other artists online. I wanted a way to increase those connections, and bring them into the real world. Seeing the way my postcards were received and wanting to increase connections between artists, I got this idea about the swap. 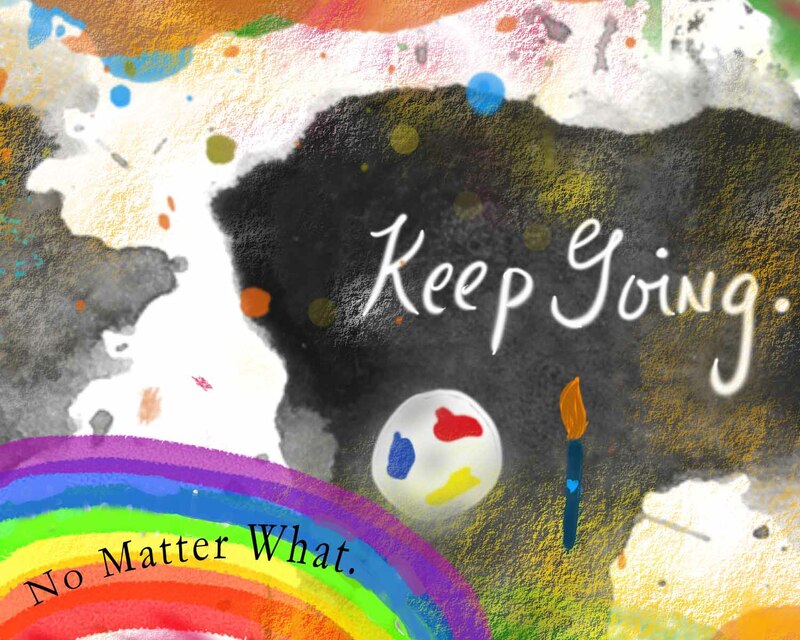 I thought it would be a great way to encourage others to reproduce their work and share it as a simple postcard, to brighten the day of those who received them, and to make connections between artists of disparate mediums in disparate places. It worked better than I ever thought it would! It was such an amazing experience to have so many artists from around the world sharing their art with others. I received so many comments from people who said this was the first time they had printed their work, or shared it with others. It pushed them out of their comfort zone in a good way. That was an unexpected and wonderful benefit to the swap! I truly believe that good things happen when you Liberate Your Art into the world. I've seen it, first hand! This swap is a great way to encourage artists to share their art and connect with others in new ways. You can learn more and sign up for all of the swap details at this page on my website: http://kateyestudio.com/liberate-your-art-postcard-swap. I hope to see many of the Paint Party Friday participants joining in again this year! Another creative and hopping party last week with so many wonderful paintings! 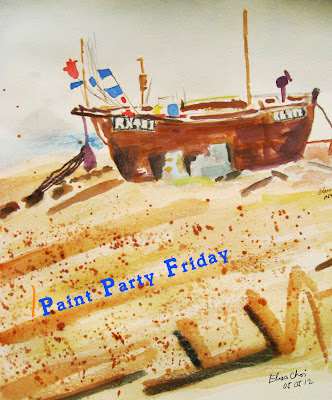 Welcome to Week 12 of Paint Party Friday (Year 2) and to the next edition of our Featured Artist Series! (Would you like to be a PPF Featured Artist? Please click here for details!) This week we are thrilled to feature a very versatile and enthusiastic artist all the way from Iceland. Please welcome Sigga Dis! 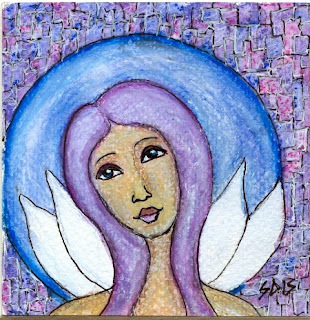 My name is Sigga Dís, I´m 53 years old, a Mixed Media artist and an art teacher, teaching children ages 6-16. I was 42 when I went to University to learn to become a teacher, an art teacher. I have always been doing some kind of art. Art class was my favorite class in school and I did go to art class after school too. I have been working with oils, acrylics, watercolors, glass, clay, making paper and just all kinds of material. If I´m not painting, I´m knitting or doing some needlework. I think my painting has been evolving all the time but today I feel like I can work with almost all materials without fearing that I can´t and that feels good. 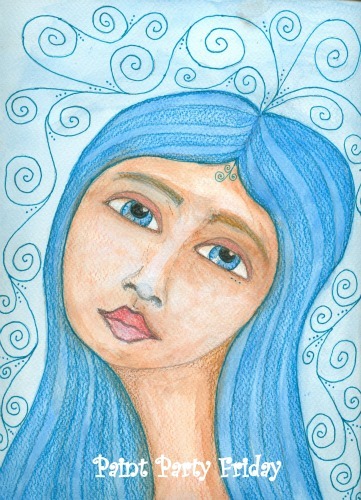 I have been taking a few classes with Tam at Willowing.ning.com. The best class ever I think is the Live Book where Tam is teaching with I think 15 other teachers for one year. Each teacher teaches a different style and different technique. One of the teachers is Mystele. Something happened to me after her class where she was teaching us to paint ladies with a big nose and eyes all over the place. I just fell in love with her technique and since her class I have been painting and painting, having so much fun and liking my work very much. I'm using acrylics, watercolor, all kind of pens, stamps, paper, watercolor paper and just everything I have around me. Painting angels has for a long time been my favorite. I have painted angels many ways, big and clumsy, small and beautiful and everything there in between. But I have also been painting all kind of things. Now after Tam's Fabulous Faces I learned how to draw faces and then I began to draw girls, ladies, beautiful angels and little girls. As I said before I´m painting clumsy but beautiful ladies now, but of course I continue taking Live Book classes as soon as they come every other week. I think that must have been when I had my first solo exhibition and sold a very expensive one. And now few weeks ago I was asked to have an exhibition, that was a good feeling. So now I´m going to have my 5th solo exhibition in 3 years and one more to come in September. A few days ago I bought Kelly Rae´s e-book, Flying Lessons. It was on 50% discount for one day. I´m reading it and I´m going to learn from it now as I´m working on my own shop, having a blog and a FaceBook like page. Please come for a visit. It would make me very happy. I want to make something out of my art. 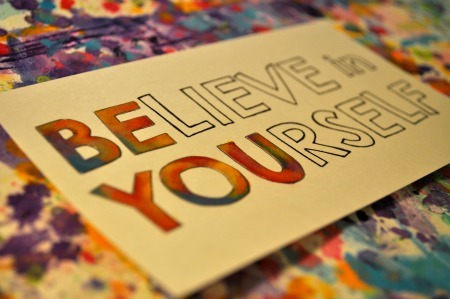 And from now on I´m going to say like one of my FB friends said, I´m an artist and that feels good.